This is part of an intermittent series of blogs featuring advertisements found in our collection. You can find the entire series here. In American Journal of Obstetrics and Gynecology 83, no. 3 (1962). Nobody conjures the ’60s better than Matthew Weiner and the writers, designers, and stylists of AMC’s Mad Men. We’ll miss the quotidian details: the trash left behind at the Draper family picnic, that unbelievable maternity dress of Trudy’s, the choking smoke of Mohawk’s planes, Metro-North’s trains, and Don’s automobiles. When Sally Draper puts a plastic dry-cleaning bag over her head and her mother scolds her—not out of fear for her safety and only for dumping her dry-cleaning on the floor—we’re gob-smacked. These moments crystallize the seismic shifts that have occurred in cultural expectations over the last fifty years. The Academy Library has strong holdings in the major journals of the 19th and 20th centuries. Journals were then, as they are now, the primary place of publication for innovations and discoveries. In addition, the advertisements aimed at the professional readers of these journals offer insights into changing cultural beliefs. Most libraries excised the advertisements, especially if they were gathered in a separate section of the journal. The Academy tradition was to keep the advertising, and these ads are now heavily used by historians. The images and texts in these advertisements provide artists, writers, and historians with richly-textured cultural context. 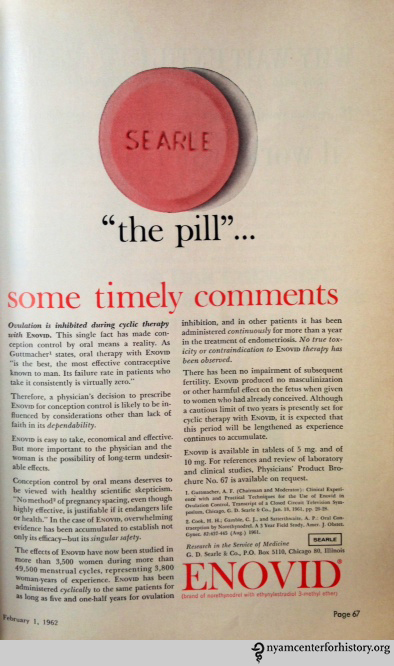 There is much to be learned, for example, from looking at the way antidepressants were marketed to women in the twentieth century, at the early advertisements for the birth control pill, and at tobacco advertising aimed directly at physicians as consumers. Here, a look at a Flavorwire piece we wrote using ads entirely from our collections and relating them to Mad Men. This entry was posted in Collections, History of medicine and tagged ads, advertisements, Flavorwire, Mad Men, medical journals, serials by nyamhistorymed. Bookmark the permalink.